Dietary gluten is the etiological agent of celiac disease (CD), but it has also been postulated to play a role in the development of type 1 diabetes (T1D) . In animal models of autoimmune diabetes, removal of dietary gluten protects against the development of autoimmune diabetes . In humans, T1D and other autoimmune diseases occur at a lower rate in patients diagnosed with CD at a younger age, suggesting that early elimination of gluten may protect against the manifestation of T1D and of other autoimmune disorders . In order to test the hypothesis that eliminating dietary gluten can reduce islet-associated autoimmunity we performed a pilot study in which seven non-diabetic first degree relatives (age 1.2-5.9 years of age) of patients with T1D with consistently elevated levels of islet autoantibodies (i.e. antibodies in two consecutive samples) were placed on a gluten-free diet for 12 months followed by a normal diet for a further 12 months . The parents of all enrollees were thoroughly trained on the dietary regulations of a gluten-free diet. Outcome markers included autoantibodies to insulin, GAD, IA-2, and transglutaminase measured by radiobinding assays in samples prior to, and at commencement of diet, and at 3-month intervals throughout the intervention period . A successful outcome was defined as a reduction by at least 50% of at least one antibody titer at the end of the gluten-free period. The antibody variations observed in these seven relatives at risk were similar to the rises and falls in autoantibody levels seen during the preclinical period of T1D . Major titer reductions in the gluten-free period were observed in only one subject for all antibodies, and this and a second individual developed T1D during the twelve-month gluten re-exposure period. From these data we concluded that the removal of dietary gluten does not modulate T1D-associated antibodies in high risk subjects . However, in that study we did not test whether a gluten-free diet can delay the onset of diabetes. Therefore, we followed the 7 children formerly placed on a gluten-free diet for the manifestation of T1D for up to 5 years (mean follow-up time after fulfilling inclusion criteria: 4.8 years, SE 0.82 years) and compared them to 30 siblings and offspring of patients with T1D from the Munich Diabetes Family and the BABYDIAB studies [4, 5] with similar characteristics to the intervention group (age < 6 years, > 1 islet antibody in consecutive samples, normal OGTT (oral glucose tolerance test), mean follow-up time: 5 years, SE 0.62 years). 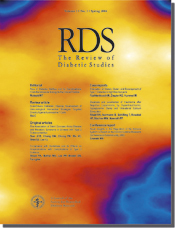 According to Kaplan-Meier life-table analysis, the cumulative 5-year risk of T1D in the seven individuals placed on a gluten-free diet was 42.9% (95 CI (6.3-79.5%)) compared to 49.7% (95 CI (30.9-68.5%)) in the non-treated, prediabetic control relatives (p=0.87, Figure 1). Two of the seven subjects under intervention remained free of diabetes during follow-up. Interestingly, these two individuals both had falling islet-antibody levels in their last follow-up sample for most of the autoantibodies tested, returning to negative results or subsiding to levels closely above the threshold for positivity. One subject had returned to negative results for ICA and IAA and showed a reduction in titer of > 50% for IA-2A (10 Units, threshold 2.5 Units) while GADA remained relatively stable over time (last sample: 118 Units, threshold 8.5 Units). In the second case, IA-2A could not be detected in the last follow-up sample while IAA were still falling slightly. However, titers of GADA and ICA did not change significantly over time in this subject. In contrast, all five subjects formerly on a gluten-free diet who developed T1D during follow-up were positive for all antibodies tested (IAA, ICA, GADA and IA-2A) in the last follow-up sample showing relatively high titers in all cases. This observation is consistent with a fully activated and widespread immune response to islet antigens in high-risk relatives close to manifestation of T1D. Figure 1. Risk of progression to diabetes by Kaplan-Meier analysis in 7 children on a gluten-free diet compared to historical con-trol siblings and offspring (p= 0.87). All children in both the inter-vention and the historical control group had multiple islet autoanti-bodies and a normal OGTT at the start. The 5-year follow-up results show that removing gluten from the diet over a period of one year does not delay or prevent the development of T1D in young high-risk relatives. The data also suggest that dietary intervention is effective neither in the short nor in the long term in high-risk prediabetic individuals who often present with a fully activated immune response to different islet antigens close to manifestation of T1D. Our results also support the notion that it is absolutely crucial to bear in mind that any intervention including the removal of gluten from the diet may lack any protective effect when applied to individuals with a high inherent risk of T1D such as first-degree relatives with persistent, i.e. established islet-autoimmunity. Thus, the discrepant finding that islet antibodies in patients affected with celiac disease disappeared after commencement of a gluten-free diet in a large proportion of patients  may rather reflect that these patients had a much lower risk of T1D. While the removal of gluten from the diet does not confer protection from diabetes in high-risk prediabetic relatives with established islet immunity, it may prove to be protective when applied as early in life as possible. We recently reported that supplementation with foods containing gluten before the age of 3 months in offspring of mothers and fathers with T1D (BABYDIAB study) was associated with significantly increased islet autoantibody risk (adjusted hazard ratio, 4.0) compared to children who received only breast milk until the age of 3 months (p<0.02) . Four out of 17 children who received foods containing gluten before the age of 3 months developed islet autoantibodies and all 4 children had the high-risk DRB1*03/04, DQB1*0302 genotype. Based on these findings, we started the BABYDIET intervention trial which tests the hypothesis that preventing early exposure to dietary gluten for 6 and 12 months after birth and after exclusive breastfeeding in offspring and siblings of individuals with T1D genetically at risk of T1D (carrying the genotypes DR3/DR4 or DR4/DR4) may prevent or delay the onset of islet-autoimmunity reflected by the appearance of islet antibodies. As of February 2004, 400 children underwent screening and 52 subjects have been enrolled. This study will help elucidate whether the timing of dietary intervention makes a difference. Acknowledgments: This study was supported by DFG grants Zi310/12-1 and 12-3. We thank A. Knopff and M. Walter for technical assistance.